3rd Saturday of each month – this is limited to 4 children and will take place at 12.00 noon. Step 1 – Contact the parish secretary for availability. Step 2 – Fill out the baptismal form in the sacristy. NB: this is to be done in advance, preferably about 4 weeks (depending on availability). A Parent or Parents must fill out the form themselves in the Parish Office. 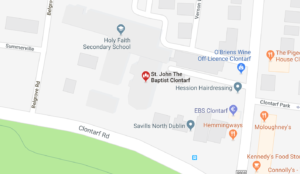 A meeting will take place with the Baptismal Team on the previous Wednesday before the second Sunday at 7:30pm in the parish centre. This prepares the parents for the baptism ceremony. It also provides an opportunity to meet other parents whose children are being baptised. A Baptismal Candle – Candles may be purchased at the Church for €5 each. Godparents and parents are advised to take part in the celebrations of the parish on a regular basis.